The local Leagues host many activities, have opportunities for volunteering, and provide access to additional publications and resources. Members of the local Leagues are automatically members of the League of Women Voters of New Mexico (LWVNM), so you'll get the newsletter from your local league as well as the state newsletter, La Palabra, which comes out four times per year. 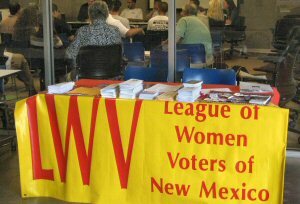 If you don't live in or near one of New Mexico's local Leagues, you can become a Member-at-Large of the League of Women Voters of New Mexico. The membership year for Members-at-Large of LWVNM is May 1 to April 30. You can join at any time.